A Metallica video game was in development years ago (long before Guitar Hero: Metallica), but it never saw the light of day. We’ve seen some wicked cool concept art and an high-level trailer, but now, the team at PtoPOnline (via Kotaku) has published an extended gameplay trailer showing off the game in greater detail. Damage Inc., as the game was called, was going to be a vehicular combat game with a Twisted Metal vibe. The gameplay demo seen in the video is from an early, incomplete version of the game for PS2, but it’s enough to get an idea for what the game might have been like. It was also in the works for Xbox and PC. 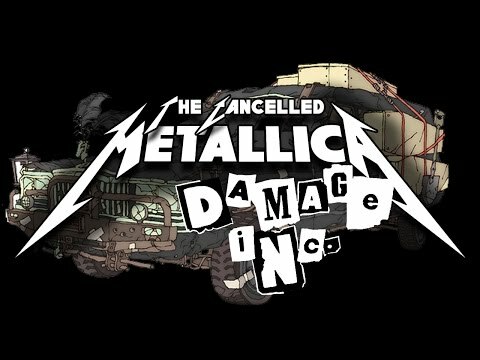 Damage Inc., which is also the name of a Metallica song, would have featured a day/night cycle. Additionally, you could get out of your car to get into another. PtoPOnline is a video game preservation site. You can learn more and support the group through its Patreon page. As Loudwire explains, some concept art for Damage Inc. showed off James Hetfield, Kirk Hammett, and Lars Ulrich–and it looked pretty cool.